An infinity pool is a swimming pool(usually a man-made pool) that is made in such a way that it produces a visual effect of water with no boundary. Infinity Pools are one of the best things that can help you relax even in the darkest days of your life. If you are stressed out or the workload is eating your brain, then you must visit and relax in an infinity pool. We present you a list of the most stunning Infinity pools around the world. Believe us, you will start feeling relaxed after looking at the pictures of these stunning infinity pools. With a beautiful visual and stunning background, Infinity pools are surely the best man-made swimming pools. And if you are a swim-lover, these pools can offer you the best experience of your life. 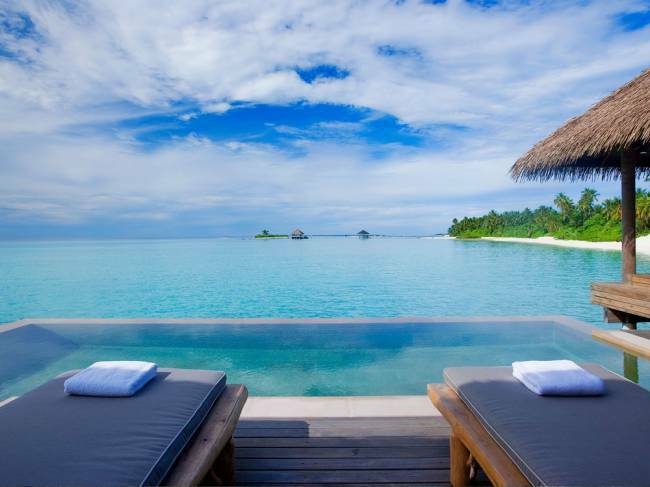 Let’s have a look at the top 10 most stunning infinity pools across the globe. Hotel Villa Mahal is located in Kalkan, Turkey. The hotel is one of the Turkey’s finest and most beautiful hotels. The hotel is equipped with a 17-metres infinity pool and a private infinity pool that appears to run into the Kalkan Bay. Sheraton Waikiki Hotel is located in Honolulu, USA and the modern resort is famous for one of the most stunning infinity pools in the world. The infinity pool in the hotel is named as Edge of Waikiki because it seems like the pool stretches endlessly and appears to run into the Waikiki beach. 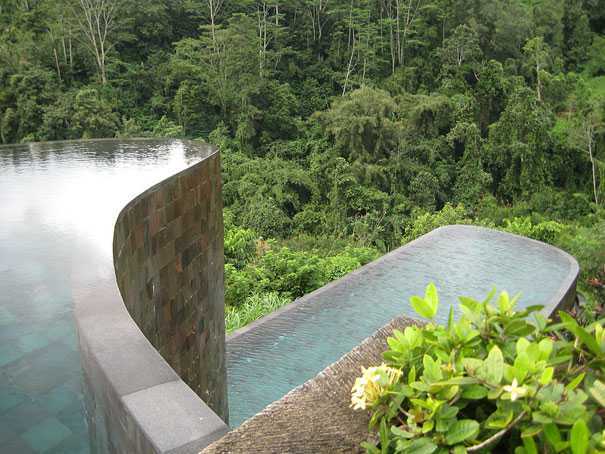 Located in the heart of the Ubud, Hanging Gardens of Bali is a resort famous for its swimming pools. The resort pools have been voted as one of the most stunning infinity pools in the world by TripAdvisor. With a beautiful nature backdrop, no other swimming pools in the world are more stylish and well designed than the pools at this resort. 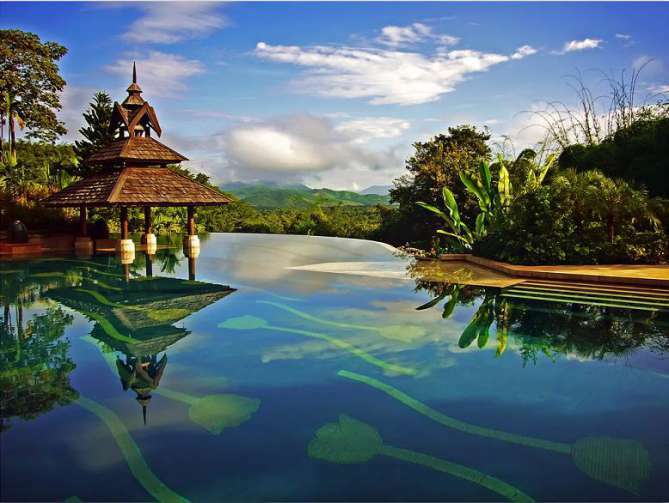 Anantara Golden Triangle Elephant Camp & Resort is located in Chiang Rai, Thailand. The infinity pools in the resort have been dubbed as the World’s Most Impressive Infinity pools. The pool offers a stunning view of the Mekong and Golden Triangle. 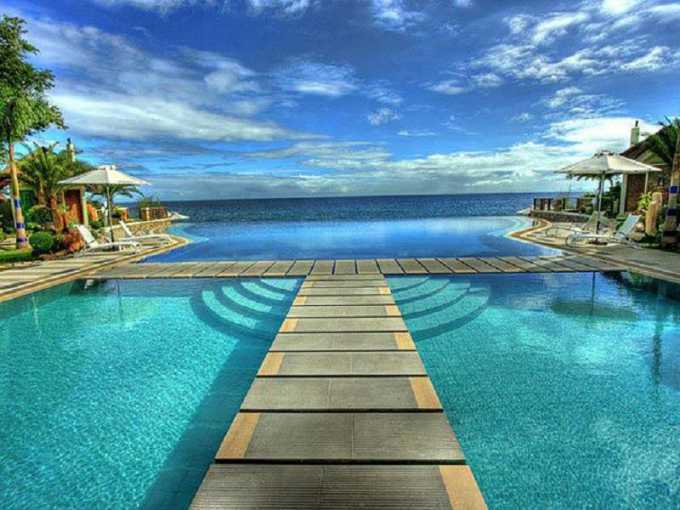 Acuatico Beach Resort is located in the Batangas, Philippines. The resort is equipped with one of the most stunning infinity pools in the world. The pool seems to meet the sapphire sea offering a memorable life long experience. The place is also equipped with a floating bar which offers famous local drinks as you take a swim in the pool. Alila Ubud sits high op on the edge of the Ayung river valley. With landscaped gardens in the background, you are guaranteed to get a lifetime experience. 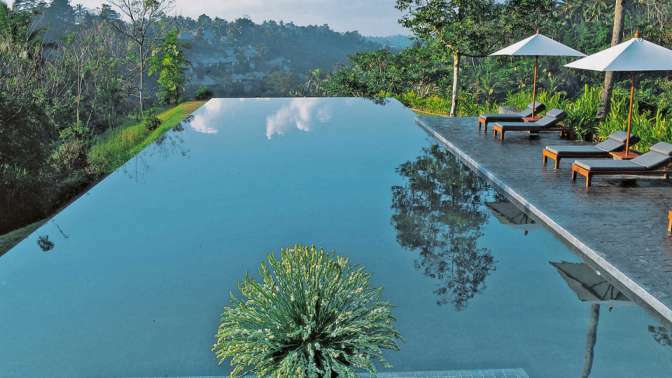 The pools are often regarded as the top rated infinity pools in the world. We advise you to visit there if you are a nature lover. We all know that Maldives is a heaven for travellers. Paradise Island Resort is located in the North Male’ Atoll. 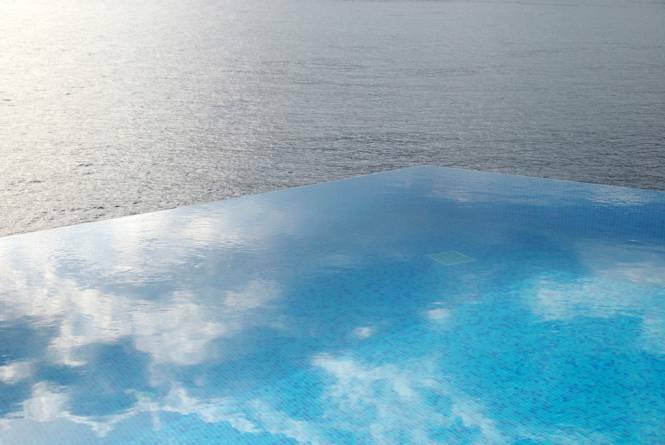 The infinity pool offers a mix of blinding blues and you can’t tell where the pool has ended and the sea has begun. Surely, it offers a mesmerising view and a lifelong experience. Marina Bay in Singapore is one of the most luxurious hotels in the world. The infinity pool is located on the 55-Storey of the hotel and you can imagine the splendid view it has to offer. The rooftop infinity pool is a bliss for you if you have a life-long dream to view a dramatic skyline. 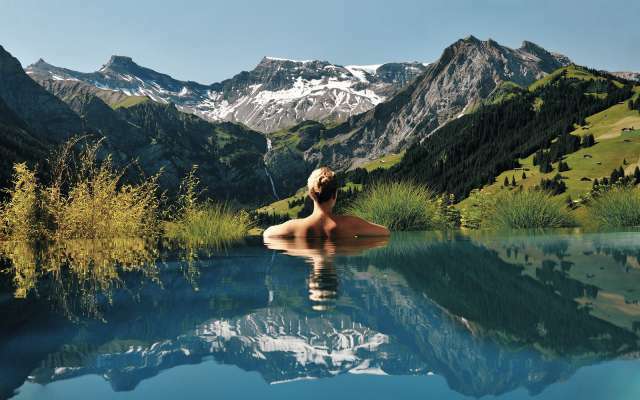 The infinity pool at The Cambrian Hotel Adelboden, Switzerland is undoubtedly one of the most stunning in the world. If you love mountains and lakes, the pool is perfect for you. The infinity pool overlooks a breathtaking view of the snow-capped Alps. 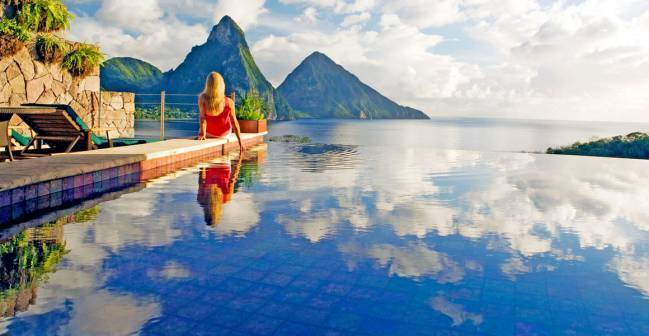 Jade Mountain Resort is located in the Saint Lucia and the infinity pool at the place gives a never-seen-before view and believe us, the view will completely mesmerise you. The background is so breathtaking that it will make your heart skip a beat. No doubt, the infinity pool at the place is one of the most stunning infinity pools in the world. Don’t miss: Top 10 Best Destinations And Places To Visit In Bangkok. Do let us know if you have visited any stunning infinity pools around the world? Share your experience with us in the comments section below.